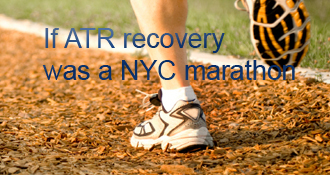 catherinel has completed the grueling 26.2 ATR miles to full recovery! Anyway. After getting really used to the new angle, and no crutches, I was zipping about all over the place, feeling great. September 14th, 8 weeks to the day after the rupture, I had my final appointment with the Ortho Specialist in Swindon. It was a day of mixed emotions, as I was elated to finally get the boot off, but afraid to hear it hadn’t healed properly. As far as I was concerned, the non-surgical method seemed like nothing more than ‘magic’. Was my tendon really capable of healing and fusing itself ? This was my first appt with the specialist at all, as I’d only seen nurses and technicians before. Anyway, they had me take it off, I held my breath as the poking and stretching and rotating began, then the doctor said: "Well done, you’ve fixed it". My range of motion was a 4 out of 5, which was awesome, but my calf muscle was 80% wasted. Oof. Well, I knew it was just the beginning of the next, and longest phase: Physical Therapy. Then I was ushered to a PT who repeated the pushing, and rotating and stretching (still really uneasy on those, convinced it was going to rip in two, without the boot). But, it was fine. Then they had me walk up and down the office. It was pretty easy, I was amazed. The gave me a silicone heel cup, and a tube bandage and sent me packing. My ‘beloved’ boot was taken away. I felt the urge to ask if I could keep it, just in case. But my optimism/superstition made me hold my tongue. "If I don’t have it. I won’t need it.." and then it was gone. I was given a few sheets of notes/exercises to do: Stationary bicycle-As tolerated. Elliptical -As tolerated. Swimming- as much as I like. Then there were the stretches, so many stretches! Am I right, people? Rotating the ankle and side to side , round and round side stepping and towel stretches etc. 3 sets, 3 times a day. I made a spreadsheet, and I was so diligent! Walking got a bit easier, but was harder than with the boot. I staying in England another 10 days, did all my exercises, and got in a bunch of swimming. Walking got better, but still got tired pretty quickly. But I could feel the flutter of my calf muscle in there somewhere, and it was getting stronger! Then on the 26th of September, with my fledgeling calf muscle flapping in the wind, I flew back to California. A few days later at 10 weeks, I had my first appointment with Kaiser. Which was classic Kaiser. I went all the way there for them to say, yes, you need PT, so you need to make an appt for that. Then almost immediately I flew to NY for 5 days, where I did a bunch of walking, probably 3-5 miles a day. Slow going though, with some pain and swelling afterwards. Then back to California again, and my first PT appt. Examination, range of motion tests and walking tests. Everything looked great, except for that calf. But I knew that already. So my prescription was as follows: calf raises (as many as you can, as often as you can). Continued Elliptical, Bicycle, walking, side to side weight bearing, and rubber band stretches ‘window-washers’ and then a seated band stretch with crossed leg (that one hurt!). Also said I don’t need the cup or support stocking. I really wish he had been more specific with the how many how much. I like detailed instructions, this felt like a bit of a free for all. A lesson in pain tolerance. So off I went and did all those, plus some swimming. Then I went to Hawaii. I think this is where I may have overdone it. I walked a lot. In flip flops. I climbed in and out of the ocean on a steep bank with very soft sand, a lot. I went snorkeling, I walked some more. I went to the gym, cycled and ‘elipticized’. My ankle was clicking, my sole was sore, my tendon was stiff, my ankle swollen, but I kept going, I was sure this was all ‘part of the healing, part of the PT, and part of powering through’. Somehow I thought it was better to wear flip flops than sneakers, as I didn’t want to coddle my tendon, and let it shrink back. I think I might have been wrong there. I came back to California, and had my 2nd PT appt. He saw me and immediately said "Are you limping?”. Yeah, I was limping. He didn’t seem bothered and had me go through a session in the office. This time it was the treadmill on full incline, side-stepping, and balancing on a half ball, and then bouncing the leg press at 50lbs with only my bad leg. I have to say this one seemed outrageous to me. It felt dangerous. But I did it. Doc knows best, right? 2 days later, I got a terrible, stabbing, boiling pain in the sole of my heel. I couldn’t walk on it, and it lasted all day. I still thought it was acceptable, I iced it, took some ibuprofen and elevated it. Most of the pain went away. But numbness replaced it. I couldn’t feel my heel at all or the sole of my heel. So, I contacted my original Ortho doc at Kaiser, she thinks I may have damaged or trapped a nerve, or damages my plantar muscle, anyway some sort of damage was done, and she had me go straight in and get fitted for….. a boot!. I couldn’t believe it. But thank goodness, it wasn’t the tendon. So here I am, 16 weeks since the rupture, and back in a boot. But it’s OK. It’s just a small step backwards, it’s starting to feel better each day, and soon I’ll be back on track. I guess the lesson here is that I confused that fine line between ‘pushing it’ and ‘breaking it’. So now we’re up to date, and I’ll keep you posted. I’m really hoping the ankle/sole isn’t going to get in the way of healing! I am planning on taking that acting course again next year! Thanks for bringing us up to speed Catherine. Glad to hear you’re on the mend. With this injury, there is a very fine line (as you’ve found)- and it’s difficult to gauge when you’re crossing it. I call it the difference between hurting and being hurt Thankfully, it doesn’t sound like you’ve damaged the tendon itself. Yup. I overdid 1-leg heel raises and suffered a month-long setback 17 weeks(!) post-op after my first ATR, under STRICT instructions from my PT, and over my initial objections!! On another ATR website, they polled their members who had re-ruptured for the details, and compiled the results. I think the leading contender (or at least one of big ones) was “PT”. The PTs didn’t get 100% in school and they don’t get 100% at work, either, just like most of the rest of us. (Even doctors!) I think most of them are way too gung-ho about dorsiflexing early on. . .
One of my fave principles is incrementalism. Whatever it is, if it’s vaguely challenging to the AT, don’t do a ton more of it than you did yesterday. If you’re fine tomorrow, try 20% more of it, and “rinse and repeat”. Thanks everyone. Great advice! I am still having heel pain and numbness, and my doc has prescribed 3 more weeks in the boot, and no PT. She thinks it might be scar tissue pushing on a nerve ‘or something’. Frustrating because I really don’t know what’s going on with it. Catherine- I’m a little ways ahead of you, at 13wks. I’ve been out of the boot for 8 weeks now. I don’t have numbness in my heel, but do still have pain (in the bottom of my heel). I think it’s partly because, due to my weak calf, I still carry more weight on my heel, and less on my toes. I think it just comes with the territory. It IS (very) slowly getting better. « Almost 17 weeks…back in a boot. My apologies! I just updated to the present! I’m with Ryan — WAY too impatient for these historical serials!! Please get to the “punch line” (the present) soon! Thanks for the story… but you can’t leave us hanging there- why are you back in a boot?? catherinel’s AchillesBlog is proudly powered by WordPress and WPDesigner..